The Seasons windows are nice and all, but those pink-only flowers were driving me nuts (as well as the lack of one-tile versions). So I thought I'd make just one without flowers, or perhaps one without shutters, and ended up spending the entire weekend in Extreme Twiddling Mode – new meshes, new subsets, new recolours, new shadows, repository linked all over the place, with matching diagonals, the whole enchilada. 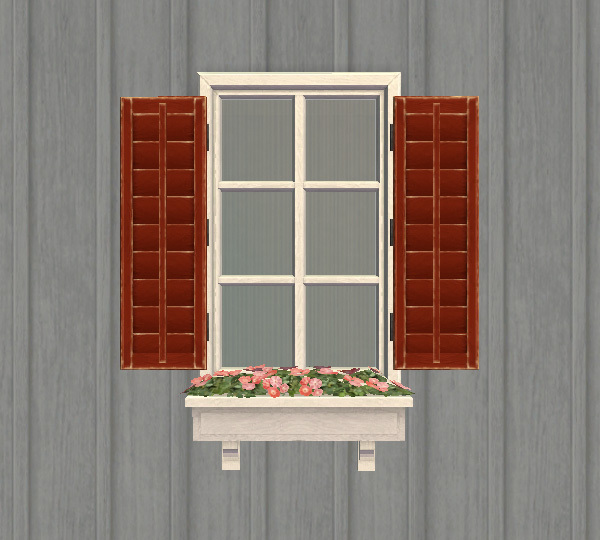 The windows are now available with and without shutters, with and without flowerboxes, on one or two tiles, with separate shutters, separate boxes, and recolourable flowers on top -- to be combined in any way you can imagine. Knock yourself out! Update, 2009-04-10: Fixed the blue thumbnails, thanks to HugeLunatic for finding the error! I had a wrong file referenced in the packages. This was only a cosmetic problem, but you may still want to redownload. 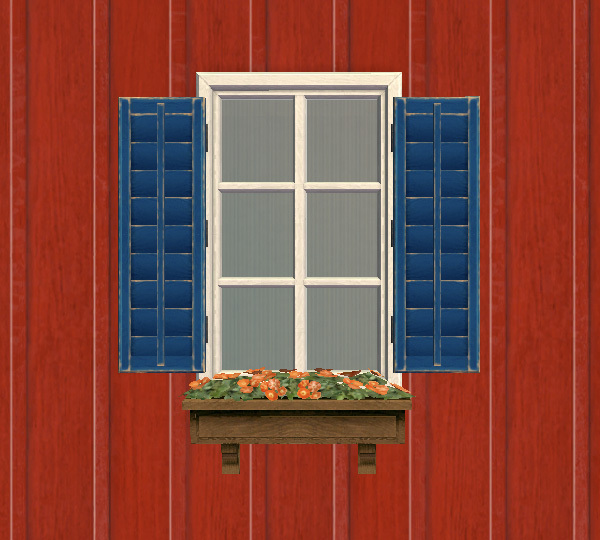 I also tweaked the single windows and shutters some more, now they're both centered. 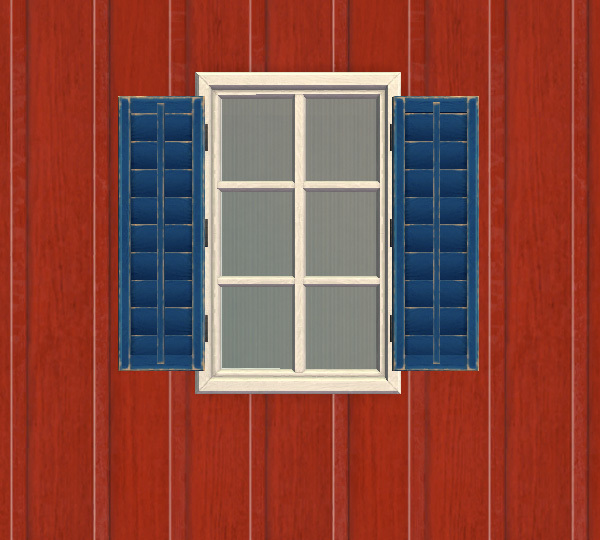 I found out in the process that not all of the Maxis windows are symmetrical either, which is probably where the issue comes from (it was in the template already, wich means all windows made with that template will still be off) .. so don't be surprised when the shutters don't match a CC window you have. 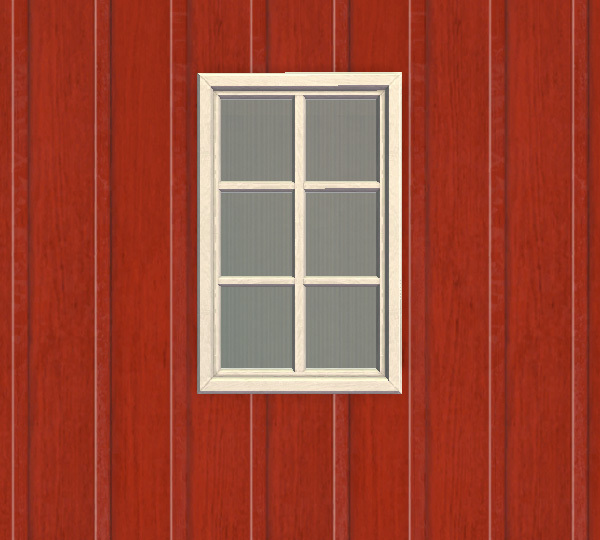 The two-tile straight window is the repository for the shutterless exterior texture: it has one default exterior (pine) built in and comes with five additional recolours that match the two other in-game textures (red and blue) as well as the recolours by Val_33 (white, green, brown) from this thread. Editing the textures was necessary because the shadow of the shutter is painted onto those textures, which looks rather strange when there is no shutter. All other shutterless windows reference this one, everything else is linked to the Maxis window. Just the meshes, all textures are pulled from the shutterless window above (exterior) and the Maxis window (everything else). The flowers in this box are *not* recolourable (just like in the origial). Just the meshes, all textures are linked to the Maxis window. The two-tile version is already in game. Just the meshes, linked to the Maxis textures. The two-tile straight version is the repository for the recolourable flower texture, all other versions reference this one. The Maxis pink is included as default; I made five additional recolours plus an invisible one (where all that shows is the empty box). The box itself is linked to the Maxis window. 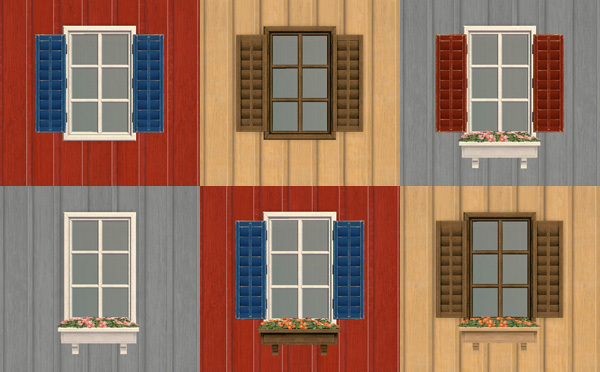 A one-tile version of the regular window (with shutters and flowers) is already available here: http://sims2code.hk/english/zet002.php (free, no registration required), so I didn't do that one again. 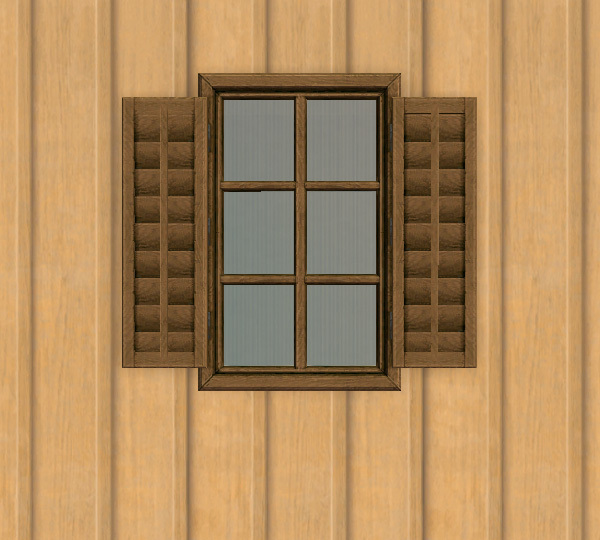 The insides of all windows behave exactly like the in-game original – they're a separate part and will use any recolours you already have. Everything is in Build Mode > Windows. The shutters cost 30§, the flowerboxes cost 40§, the windows between 80§ and 100§. 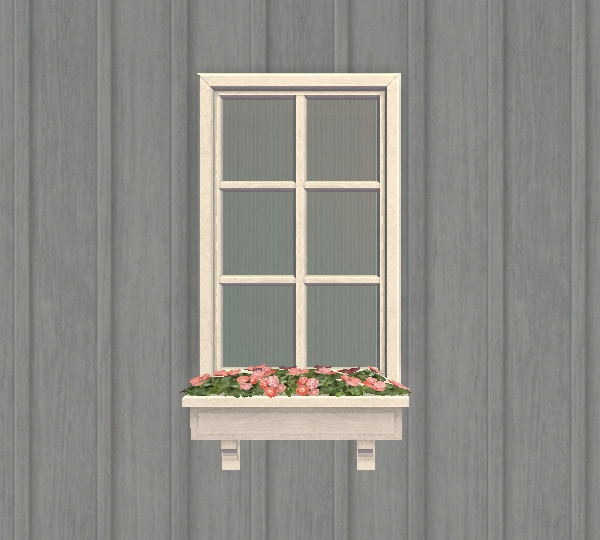 The flowerboxes and shutters behave like curtains, which means that you can put *one* of them on any window without fuss – if you want both a separate box and separate shutters, you need to use moveobjects on. They do not fulfill curtain wants. They cast no outdoor shadows, because that looks stupid 90% of the time. They have nice custom wall shadows, but those will only show up indoors. 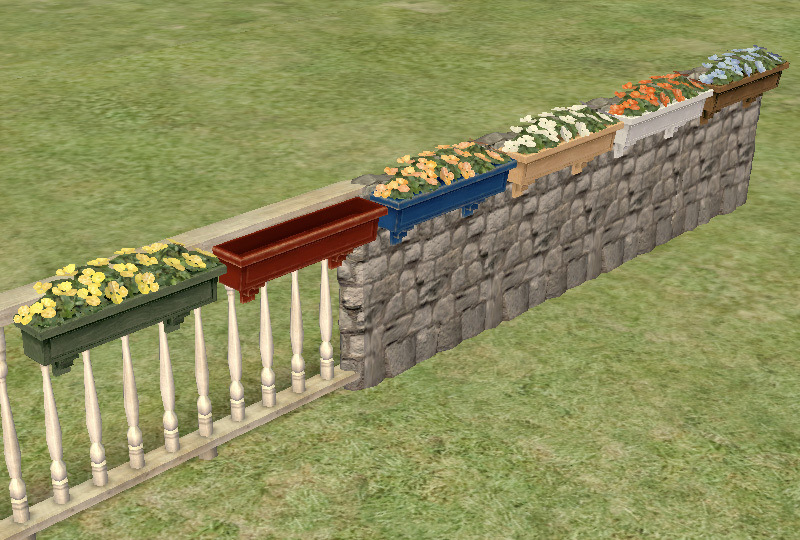 The flowerboxes have just the right height and position to be put on fences, as well (just perhaps not on the very low ones). Note that the flowers WILL cut into the wall when you put the box directly on a wall with no window in it – the mesh is exactly the same as the Maxis one, and that's just how it's positioned. * I'd love to have the wall shadows of the shutters and boxes show up outdoors as well, but alas, they don't. I'm afraid this has something to do with the fact that they think they are curtains. If anyone knows a workaround for this, I'd be grateful to hear about it. I used the abovementioned window recolour by Val_33 (and my edit of it) on most of the screenshots. I made this with the help of SimPE, Blender, Photoshop, and far too many tutorials to count -- I can basically thank the entire Create section now =).